MSF staff at work in a makeshift operating room in Port-au-Prince, in the days after the earthquake. Doctors Without Borders/Médecins Sans Frontières (MSF) is immensely grateful to the millions of people around the world who have helped finance the organization’s massive relief effort in Haiti and for the thousands of dedicated national and international staff who mobilized in the aftermath of the January 12th earthquake. At the time of the earthquake, MSF had been providing continuous health care in Haiti for almost 20 years. After the earthquake hit, MSF’s existing deployment of 800 field staff working in three facilities in Port-au-Prince was quickly expanded to 3,400 people working in 26 hospitals and clinics in the capital city and beyond. During the three-month emergency phase of the earthquake response, these teams treated 165,000 people, distributed 28,000 shelters and 85,000 non-food item kits, rehabilitated 10 hospitals, and constructed four new facilities. MSF devoted a large share of its operational resources to the establishment of emergency trauma and obstetrical surgical care. MSF was the major actor in emergency surgical care among the 30 foreign field hospitals deployed during these first three months. 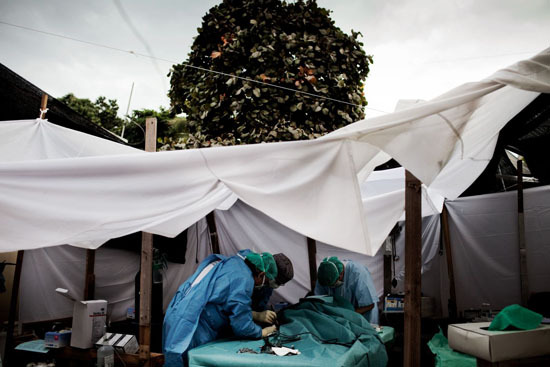 MSF surgeons performed 5,707 major surgical procedures. The Cuban government, which sent five field hospitals, reported 3,562 major operations in the same period, and the staff on USS Comfort performed 800 operations during its 7-week mission. By mid-December, in the midst of the ongoing cholera outbreak in Haiti, MSF had more than 4,000 Haitian workers are working alongside 315 international staff to maintain existing programs and mount the cholera emergency response. They run seven private, free-of-charge, secondary-level care hospitals and support two Ministry of Health structures in Port-au-Prince, accounting for nearly 1,000 hospital beds in the capital. These facilities provide emergency, trauma, obstetrical, pediatric, maternal, and orthopedic care services. Mental health care and treatment and counseling for victims of sexual violence are also provided by MSF. Outside the capital, MSF supports Ministry of Health hospitals in Jacmel with nearly 100 beds of patient capacity and runs a private, 120-bed container hospital in Leogane that opened in October. From January 12 to October 31, MSF treated more than 358,000 people, performed more than 16,570 surgeries, and delivered more than 15,100 babies. MSF also uses mobile and fixed-point clinics to provide primary medical care and relief supplies to displaced persons living in various camps in Port-au-Prince and is carrying out water-and-sanitation services to displaced persons in the Cite de Soleil slum. Through January 2, 2011, MSF teams had treated 91,000 cholera cases in 47 treatment centers located around the country.